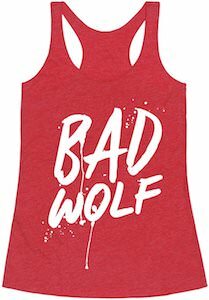 If you are a true Doctor Who fan in need of a fun top then check out this women’s red Bad Wolf tank top. The tank top is red and on it, you will find the text “Bad Wolf” in a painted look just like we have seen show up everywhere including on the Tardis. A tank top this amazing may not show its true meaning to anyone that is not known to Doctor Who and Rose and that makes it just perfect as now only true fans will understand how amazing your new shirt is. You can get this Doctor Who tank top in women’s sizes XSmall – XL for the perfect fit. If you are looking for a strong and handy Doctor Who water bottle then we found the perfect one for you. This bottle is made from Tritan and has a plain see-through outer shell and a blue see-through inner shell and on the inner shell it shows the Tardis on one side and Bad Wolf on the other. Inside the bottle offer room for 18oz of your favorite water and the spill proof top makes this a great bottle for many activities like sport, school, hiking or just reading at home. 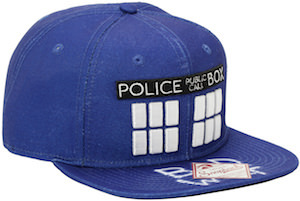 If you are a Doctor Who fan in need of a cool cap then this snapback hat is the one to look at. The hat is Tardis blue and has an snapback so that you can adjust it to fit you perfectly. 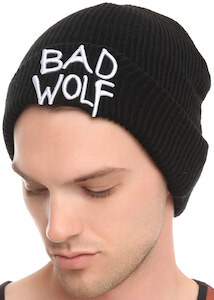 On the front you can see the windows and top sign of the Tardis embroidered on it and on the brim it says “Bad Wolf”. Now people will know you are a true Doctor Who fan and the fun blue is just a great color for a baseball cap. If you are a Doctor Who fan in need of a backpack then you came to the right spot. 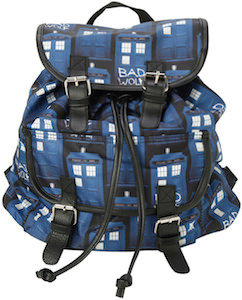 This slouch style backpack is black but is also covered in picture of the Tardis and some of them even have “Bad Wolf” sprayed on them to bring back those memories. A Doctor Who backpack like this is great for school, work and anything else. At 13 x 5 x 13 inch this backpack can quickly become your goto and favorite backpack of all time. Why get a plain backpack when you can have one that brings back memories of the Bad Wolf and of the Tardis. 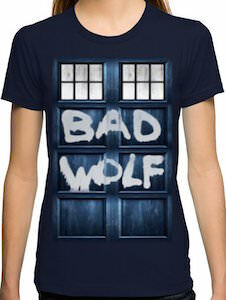 Most of the true fans that look around here know all about Bad Wolf and this women’s t-shirt brings that right back. 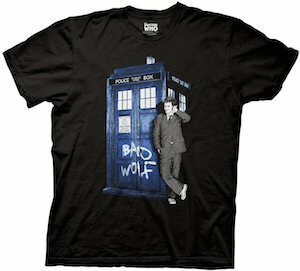 This women’s shirt comes in navy blue, black and brown and on it you can see some side panels of the Tardis and on that someone spray painted the words “Bad Wolf”. It does make you wonder if it is a message of some sort or just a kid that is vandalizing the Tardis. You can get this women’s Bad Wolf t-shirt in sizes Small – XL and it’s made from 100% jersey cotton. If you want a blue police box with graffiti on it then you have to check out this Doctor Who Tardis Spray painted Bad Wolf T-Shirt. This Doctor Who t-shirt has it all! There is the Tardis and the 10th Doctor and there is a “Bad Wolf” graffiti on the Tardis. And all that can be found on this black t-shirt. So on the t-shirt you can see Doctor Who standing against the blue Tardis with “Bad Wolf” written on the doors. It’s an amazing Doctor Who t-shirt specially if doctor number 10 is your favorite. You can get this Doctor Who t-shirt in sizes Small – 3XL and there is also a women’s version available. So both men and women can be wearing this cool Doctor Who t-shirt. 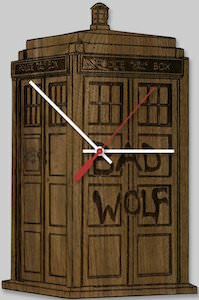 Come take a close up look at this Doctor Who Bad Wolf Tardis And The 10th Doctor T-Shirt. So you have a nice necklace but nothing cool dangling on it. Hmmm maybe Doctor Who can help. This is a Doctor Who necklace pendant that spells Bad Wolf and the D and W also make a blue Doctor Who logo and on top of that is the hanging point. The Doctor Who pendant is about 1 inch wide and is made from a zinc alloy. You have to admit that this is a real special piece of Doctor Who jewelry and I am sure that it would look stunning on you. 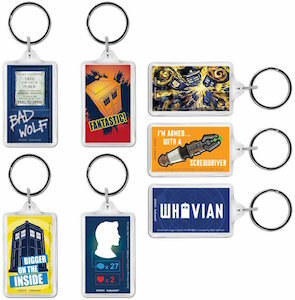 Remember the world about Bad Wolf with this Doctor Who Bad Wolf Necklace Pendant. A nice warm beanie hat is something we all can use and now there is the perfect hat for Doctor Who fans. This black watchman style beanie hat is the knit kind and on the rim it says “Bad Wolf” witch is embroidered on the hat in a raised way to give it the perfect effect. And the beanie is made from 100% acrylic making it perfect for winter. A Doctor Who hat like this is just perfect for men and women that like the Doctor but want something else then the Tardis.